Today 3rd July 2012 is Gurupurnima Known as a Vyas Purnma.Today day of the Full Moon (Purnima) during the month of Ashadh in the Hindu calendar there is a celebration which all Hindu devotees follow – it is the day when they worship their own Guru, hence the name Purnima Guru. 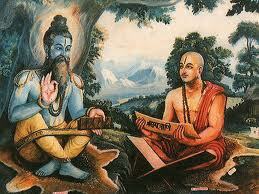 Today it is said that Krishna-dwaipayana Vyasa was born. Known as Vyasa-maharsi, he is regarded as one of the great servants of Vedic studies and the author of the Mahabharata, one of the two major Sanskrit epic poems (the other is the Ramayana) which define much of Hindu thinking and worship. Wish all of a Happy Gurupurnima.